You can, and should be able to get on from the ground, but a mounting block makes it easier for you, is better for your saddle and is easier on your horse's back.. A mounting block does make the whole process easier. Make sure whatever you use is sturdy and safe. Rickety fence rails, old chairs and thin plastic buckets can be hazardous when used as a mounting block. It is traditional to mount a horse from the near side. But you should be able to mount from the off side as well. Lead your horse out of the stable. It is unsafe to get on a horse in a confined area with low roofs or narrow doorways. If you are riding English, run the stirrups down the leathers so they are hanging free. Here are the steps your coach or instructor will take you through. Don’t worry, getting on isn’t all about strength. The first few times you’ll feel like getting on is a struggle. But, you’ll soon learn to use your balance to help you spring into the saddle. Before you get on, check to see if your girth or cinch is snug. Do a last minute check to see if all your bridle buckles are done up. Check that your stirrups are the correct length. Have you got your helmet on? In your excitement to ride small details are easy to overlook! Hold both reins in your left hand and gather them with a tuft of mane. 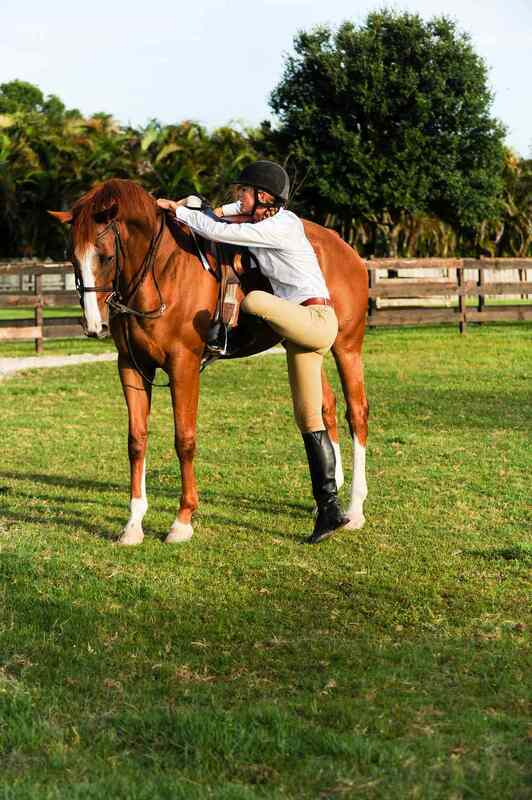 Hold the off or right side rein a tad tighter to help prevent the horse from swinging away from you as you get on. With your right hand, turn the stirrup so that the leather or fender lies flat when you are sitting in the saddle. Many people face more forward when mounting. This makes it less likely that you will poke your left toe into the horse as you are rising. Many of us were taught to face towards the back. In this picture the rider is standing so that she's facing slightly to the front. Choose whichever you prefer. If you face backwards turn the stirrup clockwise towards you. If you face front, turn the stirrup a half a turn counter-clockwise. This is so you don't end up with the leather or fender uncomfortably twisted under your leg once you are seated. Lift your left foot into the stirrup so the ball of your foot is resting comfortably on the bottom of the stirrup. You already have the reins and tuft of mane grasped in your left hand and your right hand will now grasp the cantle of your saddle. Your right leg will be balancing your weight and ready to spring. Use your right leg to push you up. You won't be pulling yourself up with your arms. Your hands and arms will be only there for balance. The spring of your leg should propel you upwards. It sometimes helps to do a few tentative springs to help gain upwards momentum. As you become balanced over the horse's withers, let go with your right hand, moving it up to grasp the reins. At the same time, swing your free (right leg if you're mounting on the traditional side) leg up and over the cantle of the saddle. Be sure to lift your leg high enough that you don't kick your horse in the haunch or hit your leg on the back of the saddle. Settle gently into the saddle. Coming down with a thud will be uncomfortable for your horse and may even startle it. Arrange the reins so that you are holding them properly. Some people like to use their right hand to turn the stirrup leather so finding the stirrup is easier. Or, use your toe to find the off side stirrup and place your foot in the stirrup so the ball of the foot is resting comfortably. You are now ready to ask your horse to walk. 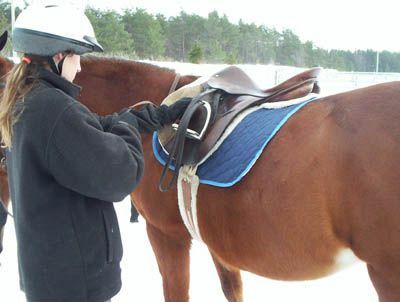 If at any time the horse starts to move off and you can't get into the saddle, slide off. Stop the horse, quiet it, and start at the beginning. It is safer to be either fully on the ground or in the saddle when dealing with a horse anxious to be off. When you are done your ride, you will need to know how to get off a horse or 'dismount'.